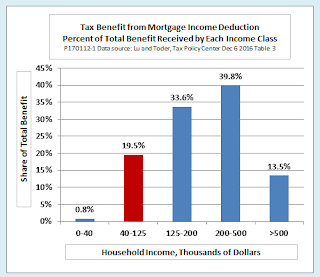 Ed Dolan's Econ Blog: Who Benefits from the Mortgage Interest Deduction? —right? The trouble is, the middle class doesn't really get all that much out of it. The chart is based on data from a 2016 study by Chenxi Lu and Eric Toder of the Tax Policy Center. 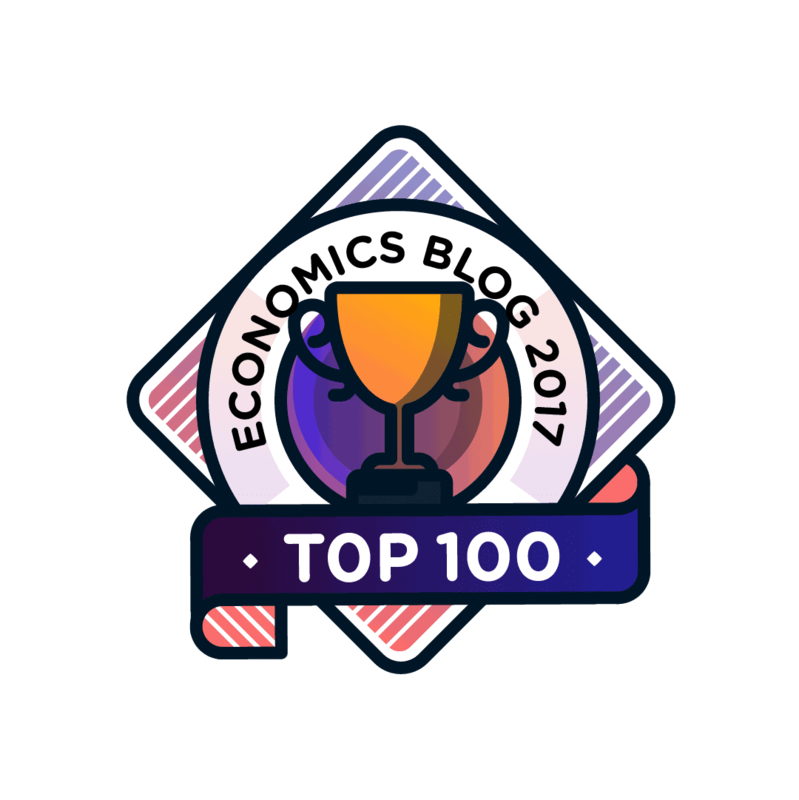 Following a definition used in a recent study by the Pew Research Center, it defines "middle class" as households earning from 67 percent to 200 percent of the median household income, or approximately $40,000 to $125,000 per year. Just under half of all US households fall in that income bracket, but they receive less than a fifth of the tax benefits of the mortgage interest deduction. Higher-income households receive a far larger share. 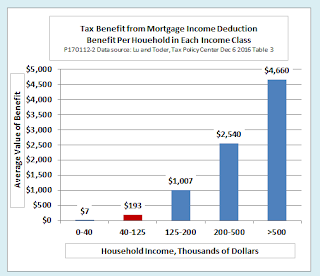 Several factors reduce the value of the mortgage interest deduction to middle-class households. First, only 21 percent of them claim the deduction at all, either because they do not own a home, because they do not have a mortgage, or because their tax bill is lower if they use the standard deduction instead of itemizing. Second, their income tax rates are lower than those of higher-income households. Third, their homes are worth less, on average. Putting all of this together, the average middle-class household receives just $191 annually in benefits from the mortgage deduction. 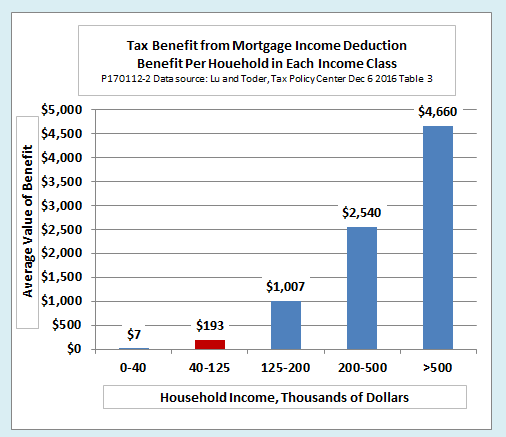 In contrast, as the next chart shows, higher-income households, on average, receive benefits of thousands of dollars per year, because more of them claim the deduction, their tax brackets are higher, and their homes are more valuable. What kind of reforms could potentially correct the inequities of the deduction, both within and between income classes, without raising the overall tax burden on middle-class households or increasing the federal deficit? Lu and Toder examine two reforms. One would lower the cap on the value of property qualifying for the deduction from $1,000,000 to $500,000. The other would replace the current tax deduction with a flat 15 percent tax credit, which would help all households equally regardless of their tax bracket. They conclude that either of these reforms, or both in combination, would be an improvement over the current system. An alternative, which I have discussed in detail in a previous post, would be to eliminate the mortgage interest deduction entirely, together with several other federal benefits and tax preferences, and replace them all with a universal basic income. Properly structured, a UBI of that kind would protect the overall after-tax incomes of middle-class families while reducing inequities within and between income classes. Additional consideration is that mortgage interest tax deduction is a financial incentive that makes home ownership more more affordable, thus possibly driving home prices up. So, if future deductions are factored in home prices, the cumulative deductions received by the owner over the term of the ownership can be viewed as the refund of the premium that the owner has paid upfront, at the time of the purchase. 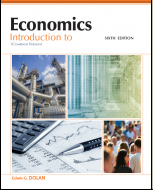 An alternative hypothesis, is that higher home prices result in higher R/E taxes, in this scenario federal deduction is used to pay higher local R/E taxes, thus deduction doesn't really make home ownership more affordable, and therefore doesn't affect home prices. Whichever hypothesis is correct, in either scenario - the homeowner, in terms of money left in the pocket, gains only a fraction of the deduction amount, if anything at all.